By choice, Mark Boyle basically doesn’t have a cent—or, more accurately, a pence—to his name. Boyle lives in rural England in a trailer he spotted on Freecycle.org. He feeds himself by growing everything from barley to potatoes, foraging wild edibles like berries and nettles, and occasionally dumpster-diving for luxuries like margarine and bread. He cooks with a wood stove fashioned from large restaurant olive cans; brushes his teeth with his own mixture of cuttlefish bones and fennel seed; and makes paper and ink from mushrooms. He barters labor for rent, Internet service, and whatever else he can’t find, grow, or make. This experiment in currency-free living started in 2008 after Boyle, an Irishman who worked in the organic food industry, saw Gandhi and was inspired by the Indian nationalist’s legendary asceticism. 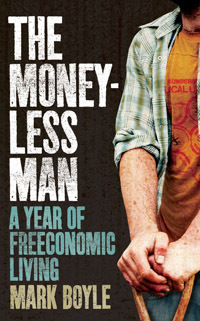 Boyle’s experience became the basis for his book, Moneyless Man: A Year of Freeconomic Living, which has just been released in the states. By the end of his year without dough, he’d decided that the life he’d gained by shedding currency was worth continuing. When I recently spoke with Boyle, he was making plans to buy land with the royalties from the book—his only cash transaction in the last two years—to start a moneyless community. He talked about the insights that drove him to make his new lifestyle more permanent. MB: Yeah. I think greatest thing I’ve gained from the last two years has been a massive sense of liberation. There’s a really good quote from Epicurus; he says, “If you want to make Pythocles rich, do not add to his wants but subtract from his desires.” When you reduce what you need in life to the bare minimum, then that’s when you achieve true freedom. It’s kind of like an alcoholic: You have to keep drinking more and more alcohol to sustain a certain level of drunkenness. In a way, I think we’re like that. We’ve never got enough. So the more we consume, the more we want. And the more we want, the more we have to work to pay for all these things and insure them and then get stressed about them and protect them and get bigger houses. I think true freedom comes with letting go of them.